It’s that time of year again: the time when everyone who writes about games feels compelled to catalogue their experiences into top ten lists and award some lucky contestant the meaningless title of Game of the Year. It’s a fun way to collect our thoughts, reflect on how the medium advanced (or didn’t advance) since the last time around, and, most importantly, argue endlessly about why everyone else’s list is wrong. 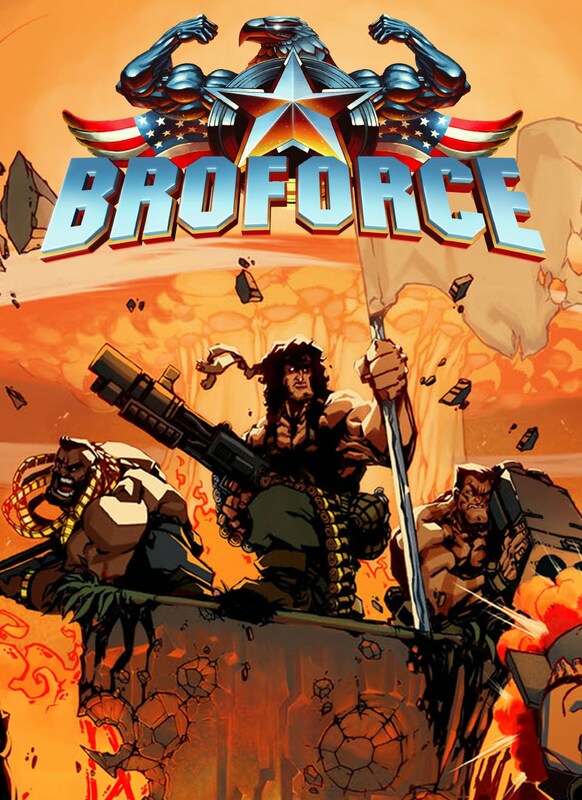 So without further ado, here’s the #8 title on my personal countdown: Free Live’s Broforce. What did I tell you? You know right now whether you’re going to love this game, don’t you? You don’t have to read another word. 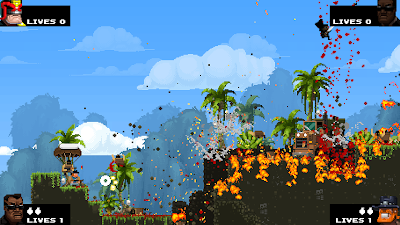 But in case you feel compelled to anyway, here’s the lowdown: Broforce is a one-to-four-player, ultraviolent, superficially retro side-scrolling shooter evoking classic Contra and Metal Slugs had either of those series featured fully destructible pixel art environments in the vein of Terraria. That is, if Terraria were in a constant state of explosion orchestrated by an enormous roster of barely-disguised, over-muscled Hollywood action heroes like Rambro, Bronan the Brobarian, and The Broniversal Soldier. Yes, all the Bros have some variant of “bro” in their names. Even if they are not, traditionally speaking, a bro. These Bros band together to spread the screeching eagle of AMERICAN FREEDOM across the world and LIBERATE the inhabitants of locations like VIETMAN (yes, you read that right) from the FREEDOM-HATING FORCES OF TERROR led by SATAN THE DECEIVER himself. Mostly by blowing everything up, then shooting the devil in the face. It’s cheeseball satire of American politics and hypermasculinity sufficiently over the top to make Paul Verhoeven look downright subtle. Like the best of Verhoeven’s movies it works through sheer gleeful commitment to its absurdity and a genuine (if conflicted) love of the (mostly) mindless action films of which its characters and set pieces are parodies. At first the game plays like a cartoon chaos simulator, particularly if you jump right in with friends. Bros die after a single point of damage, and so everything from stray bullets to falling debris to suicide bombers can mean instant death for a Bro or (way more frequently than you’d think) set off a chain reaction of explosions and ricochets that leaves your entire team dead in seconds. No big deal, though - you can jump right into the action and try again. 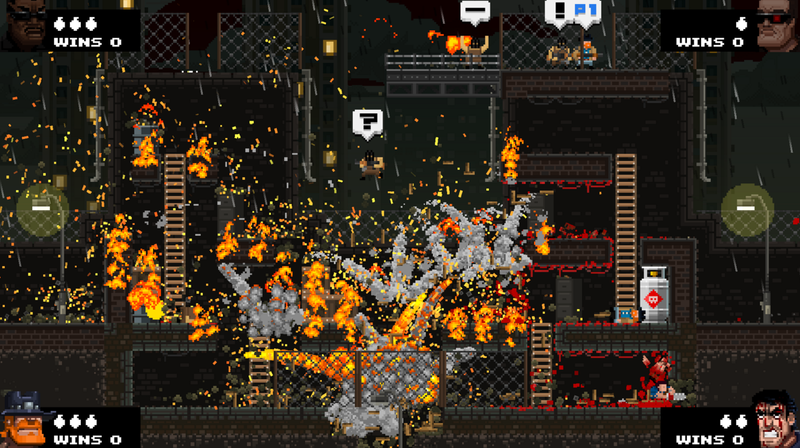 Levels are small enough that they can be blasted through in minutes once you’ve gotten the lay of the land and decided how to “solve” their destructible environmental deathtraps in any one of thousands of possible ways. More often than not, the path of least resistance it to take the slow, stealthy approach - much easier as a solo player than with a team of enthusiastic IRL bros - but blowing the crap out of everything and dodging the fallout bullet-hell style is always an option and frequently the most effective way to blow off frustration at an especially difficult area. 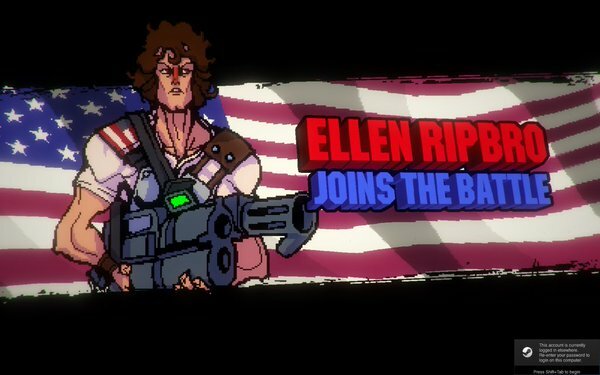 The wonderful thing about Broforce is that it enthusiastically supports so many unique playstyles. You can have a blast treating it as a solo environmental physics puzzlebox - and the levels are exquisitely designed to support this choice - or you can turn it into a contra-esque speedrun affair, testing your ability to zip through levels and put a bullet in Satan’s head without taking a hit, or you can just laugh it up with friends and turn the whole comedic affair into a high-octane silly death party. Every Bro controls and combats in completely unique ways, some even breaking entirely from the Attack/Special Attack/Melee control schema to introduce all sorts of whacky shenanigans, like Mr. Anderbro (Neo)’s ability to hurl his body through the air like a human rocket and stop bullets in flight, or Brobocop’s precision targeting system that allows him to plot the path of his bullets, or Indianna Brones’ ability to whip enemies into frightened submission and swing around like Spiderman. Dynamite turkeys are also involved. Things are actually going pretty well here. For somebody. Broforce pays brilliant homage to traditional arcade run-and-guns while taking full advantage of modern innovations. The narrative isn’t anything especially heady (shocker), but it is full of some wonderful surprises of its own. Broforce is a ludicrous, joyful thing and easily my favorite “traditional” co-op experience of the year, which to my mind more than merits its place on this list.